Sunny. High near 80F. Winds S at 15 to 25 mph..
Clear to partly cloudy. Low 59F. Winds S at 10 to 20 mph. Scientist-Astronaut Owen K. Garriott poses in his in space suit, holding his helmet. 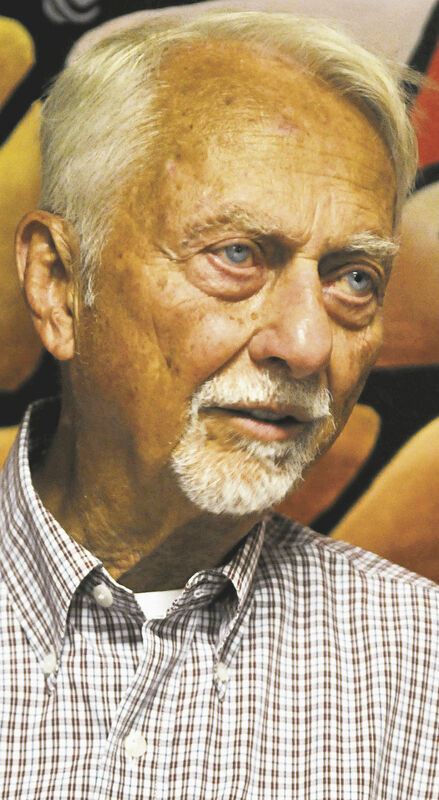 ENID, Okla. — Enid-born Skylab and space shuttle astronaut Owen K. Garriott died Monday, April 15, 2019, at age 88, according to his family. A memorial service will be held at a later date. Dr. Owen K. Garriott, 88, of Huntsville, AL, passed away on April 15, 2019, at Huntsville Hospital. The nonprofit Association of Space Explorers received word Garriott died at his home in Huntsville, Alabama. 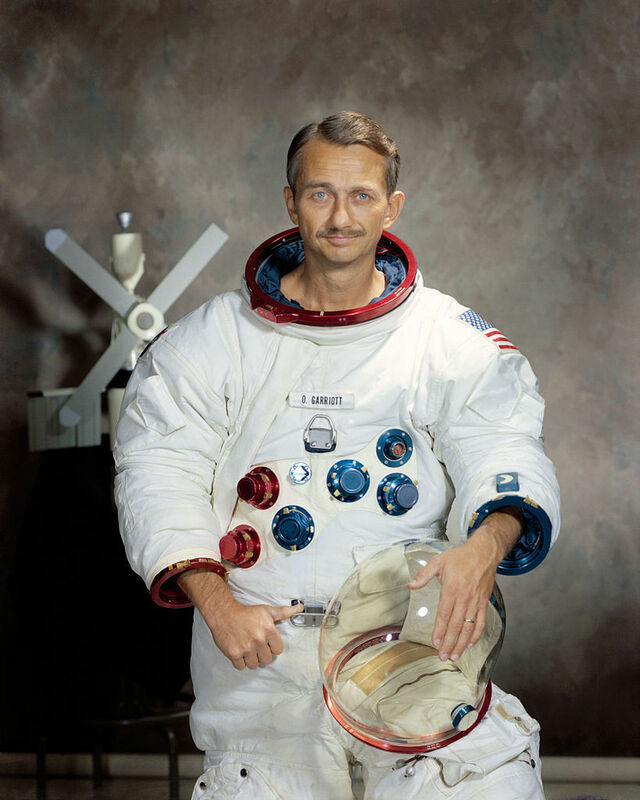 "Astronaut Owen Garriott was a good friend and an incredible astronaut," Buzz Aldrin, an American engineer, a former astronaut, fighter pilot and the second man to walk on the moon, wrote on Twitter. "I have a great sadness as I learn of his passing today. Godspeed Owen." Garriott was born Nov. 22, 1930, in Enid and graduated from Enid High School in 1948, according to the Oklahoma Historical Society. He earned a bachelor of science degree in electrical engineering from the University of Oklahoma in 1953. Serving as an electronics officer in the U.S. Navy from 1953 to 1956, he then received a master of science degree in 1957 from Stanford University and a doctorate in 1960, according to the OHS. He taught electronics and physics at Stanford and was selected as a scientist-astronaut by the National Aeronautics and Space Administration (NASA) in June 1965. Receiving jet pilot qualification, Garriott completed the U.S. Air Force Pilot Training Program in 1966 and was awarded an honorary doctorate of science degree from Phillips University in 1973. Garriott's initial space flight on Skylab 3 was from July 28 to Sept. 25, 1973, according to OHS. On this mission, he and his two crewmates conducted major experiments in science and medicine for a total of 1,427 hours in space. In three separate space walks outside the Skylab, Garriott spent 13 hours and 43 minutes. According to NASA, his 1973 Skylab flight set a world record with a duration of approximately 60 days, which more than doubled the standing record. On Nov. 28, 1983, Garriott made his second space flight aboard the Space Shuttle STS-9, which included the first flight of the Spacelab 1 international science station. That mission carried the first international shuttle crew and payload specialists. On this flight, he also conducted the first manned amateur radio operations in space. In 1986, Garriott resigned from NASA to go into private business, according to the OHS. In another tweet, retired astronaut Scott Kelly called Garriott a pioneer of long-duration spaceflight with Skylab. Garriott, along with former wife, the late Helen Walker Garriott, was co-founder of Leonardo's Children's Museum. During his return in 2006, Owen Garriott said his first visit to the building had occurred the 1930s. “I was a Cub Scout then, and it was a candy factory,” he said at the time. Garriott thanked those at a Leonardo's dinner for helping to keep Leonardo’s going and told them it would help Enid’s children. “This is a place that will help with the growth of the young people for years to come,” he said. In 2015, Garriott said he expected mankind to reach Mars within the next 30 years. In the meantime, he said asteroid exploration will increase. According to Encyclopaedia Britannica, Garriott later worked as a consultant for various aerospace companies. From 1988 to 1993, he served as vice president of space programs at Teledyne Brown Engineering and was awarded the NASA Distinguished Service Medal in 1973 and the NASA Space Flight Medal a decade later. Garriott’s son, video-game developer Richard Garriott, was a pioneering space tourist to the International Space Station aboard Soyuz TMA-13 in 2008. The portion of U.S. 412 that goes through Enid is named Owen K. Garriott Road after the hometown astronaut. According to Laughlin Funeral Service and Crematory, Garriott is survived by his wife, Eve; children, Randall Garriott (Kathy) of Walhalla, S.C., Robert Garriott (Marcy) of Austin, Texas, Richard Garriott de Cayeux (Laetitia) of New York City, and Linda Garriott (Jeff Stamp) of Dripping Springs, Texas; stepchildren, Cindy Burcham (Steve) of Huntsville, Ala., Bill Eyestone (Heather) of St. Augustine, Fla., and Sandra Brooks (Stephen) of Madison, Ala.; 12 grandchildren; and three great-grandchildren. Memorials may be made to Leonardo's Children's Museum and Adventure Quest, 200 E Maple Ave., Enid, OK 73701, or in Alabama to the U.S. Space and Rocket Center, HudsonAlpha Center for Biotechnology, or Huntsville Botanical Garden. In his hometown of Enid, Oklahoma, Owen K. Garriott’s name is on the city’s main thoroughfare, also known as Highway 412. ENID [mdash] The funeral for Henry Richard Keefer is currently pending with Henninger-Hinson Funeral Home. The services for Paul David Klassen, 40, of Tennessee, formerly of Enid will be at 2:00 P.M. Friday April 19, 2019 in the Bible Baptist Church. Condolences to the family may be made online at www.Brown-Cummings.com.